This page will introduce professional partition software for Windows 2008 users when they cannot extend C drive under Disk Management. Download IM-Magic Partition Resizer Server to extend C drive in Windows 2008 when Disk Management was unable to extend it. Partition software is a good choice when C drive is running out of disk space on Windows Server 2008 and Disk Management cannot extend the C drive space. 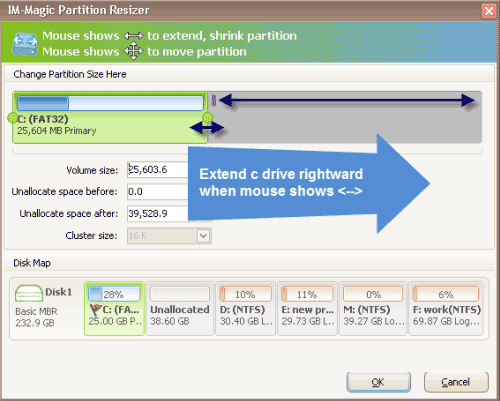 IM-Magic Partition Resizer Server is specialized partition software for Windows Server partition resizing. This partition software allows you to extend C drive space on Windows Server including Windows 2003, 2008, 2012, Windows SBS 2003/2008/2012 and Windows Server 2003 R2, Windows 2008 R2, Windows 2012 R2 and more. Shrink the selected partition by moving the arrows, and then you can see some unallocated space. Move the arrows to extend C drive and space and click "Apply" button. "I need to extend C drive space on Windows Server 2008 because it only has little free space left. However, Disk Management was unable to help me extend the drive space because extend volume option is grayed out. Is there any other method to extend C drive space on Windows Server 2008? "C drive is running on low disk space on Windows Server 2008. The problem is that I don't know how to fix the low disk space problem. I tried to cleanup disk to free up space on the C drive, but it is useless. I also tried to open Disk Management to manage the disk space, but I cannot find the solution. Can somebody tell me how to fix Windows Server 2008 low disk space issue without losing any data from the partition?" Why Disk Management Was Unable to Extend C Drive on Windows 2008? If you open Disk Management on Windows Server 2008 and right click a partition, you can find "Shrink Volume" option and "Extend Volume" option. However, you may find that you can unable to choose "Extend Volume" option after right clicking C drive because the option is greyed out. Do you know why? 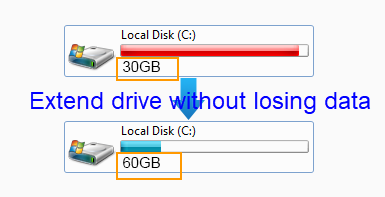 Well, if you want to extend C drive, you must ensure that there is contiguous unallocated space behind C drive. The "Extend Volume" will be greyed out if there is no unallocated space or if the unallocated space is not behind C drive. Then, is there any other method to increase the size of C drive when Disk Management failed? In order to solve the problem mentioned above, you need to shrink other partition that has lots of free space to create some unallocated space and then move the unallocated space close to C drive. "Extend Volume" option under Disk Management enables you to shrink a partition to generate some unallocated space, but unfortunately it does not have the function of moving a partition. In this situation, professional partition software is needed, because you can rely on the software to shrink partition and move partition easily. * It can work on all brands of hard disks to help resize disk partition without formatting, so you don’t need to worry that you will lose any data in order to perform partition resizing. * The partition software enables you to extend NTFS and FAT32 partition without rebooting the computer. Even the computer reboots automatically during partition resizing, it will not does any harm to the system.